At Max Windsor we know what great quality is based on: Establishing extraordinary standards and maintaining them. It means discarding or downgrading suspect product rather than taking a chance in selling it into the market. Our inspectors aren’t paid to close their eyes, and their call on quality is the final word in our factory. We are proud of our products and realize that it is their inherent quality which encourages our Max Windsor Authorized Dealers to recommend our brand above others. We have earned the trust of consumers and they have shown their appreciation for Max Windsor Floors by urging friends and neighbors to consider our flooring. We compete not just in price, but in the real value of the great floors we make. 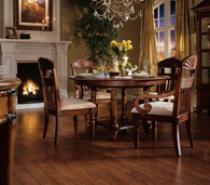 When you are ready for new hardwood flooring, specify Max Windsor. We won’t let you down. Our newest hardwood collection reflects a very special point of view. It is designed for the casual, informal interior; the city loft, country house, ski lodge, lake cabin and other spaces where living is casual, comfortable and fun. It is available in both hand-scraped and smooth finishes. Species choices include Walnut, Hickory and Maple, andOutback comes in 6″ wide planks with rustic beveled edges. Outback’s surface character is not only hand-scraped, but includes deep scratches, dents, holes and other rustic markings. 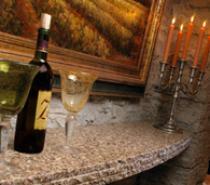 Its time worn surface is so appropriate for dens and studies, great rooms, childrens’ playrooms, bedrooms and kitchens. What a perfect selection for the eclectically furnished loft or country house with brick walls, stacked stone fireplace, exposed wood beams or other rustic architectural features. The smooth-surface colors in Outback project a sense of rustic timelessness and comfort, summoning the sensation of long ago. Their natural patinas enhance the gorgeous walnut and hickory wood from which they are made. Outback’s seven-ply engineered construction will not warp, shrink or expand, making it as ideal for interiors in hot and moist climates as in cold, dry climates. A scuff and scratch resistant application protects the surface, and Outback carries a 25 year limited wear warranty and a lifetime construction warranty. Our production facilities have earned certification by the Forest Stewardship Council (FSC) as meeting the standards for preserving the environment in which our floors are made. We use only wood which comes from the responsibly managed, renewable forest resources. Combining Max Windsor’s rugged construction standards for heavy household traffic with some of the world’s most beautiful and durable exotic hardwoods, Maximus is in a rare class of distinguished floors. With perfectly milled eased edges, these floors offer the beauty of precise fitting, yielding masterful installations. Cold Pressing, a unique Max Windsor feature, means enhanced dimensional stability, preventing delamination, cupping, crowning and seam separation. The application of 10 coats of Bona UV Finish further protects the flooring from scratches and chemicals while extending its wear. Windsor offers an inspired array of colors and textures in Maple, Hickory and American Walnut with two finishes — Smooth and Handscraped. It has won the acclaim of consumers nationwide. Windsor’s beauty and character are unmistakable, transforming each floor from the ordinary to the distinctive. In the handscraped group, the surface of each board is distressed by hand to create unique character, such that no two boards are exactly alike. This group expresses great warmth and is in harmony with today’s casual lifestyles. Windsor Smooth has a more formal esthetic, exuding charm and sophistication, and is an ideal background for traditional furnishings. Using a proprietary method of construction we call cold pressing, dimensional stability and resistance to changes in temperature and humidity are built into every board. This technique resists moisture and prevents delamination, crowning, cupping and separation of seams, even in extreme climates.